Hey Ya’ll, Let’s Talk Fall: Fabulous Free Printables! Hey guys! I simply cannot believe that we are officially in September. I know people say this often, but dang, time is just flying way too fast. I mean really…will we already have to deal with falling leaves taking over my yard? Will by baby boy be 3 in a few months? Will I really be pulling out my boots and sweaters soon? Sometimes, I just can’t deal with how fast time flies. Anywho, me and seven of my blogging buddies are hosting an awesome hashtag over on Instagram that you totally need to take part in…if you are on Instagram. It’s called the #fabfallfest where each week, we are hosting and showcasing all things Fall! And my focus is totally on the FREE printables. I’ve rounded up five of my favorite printables from around the web, so hopefully you will find some to use in you home this Fall! Who doesn’t want free art? 1) This print from Jones Design Company. I love its simplicity and think it would be the perfect seasonal addition to a gallery wall! 2) Here is a really cute print from Lolly Jane. The perfect message, especially to keep around for Thanksgiving. Also, I love the non-traditional Fall colors used. 3) Or what about this watercolor wreath printable from Place of My Taste. I love how simple it is as well. 4) Since I am loving on watercolors and wreaths, why not feature another which is pretty darn cute too! 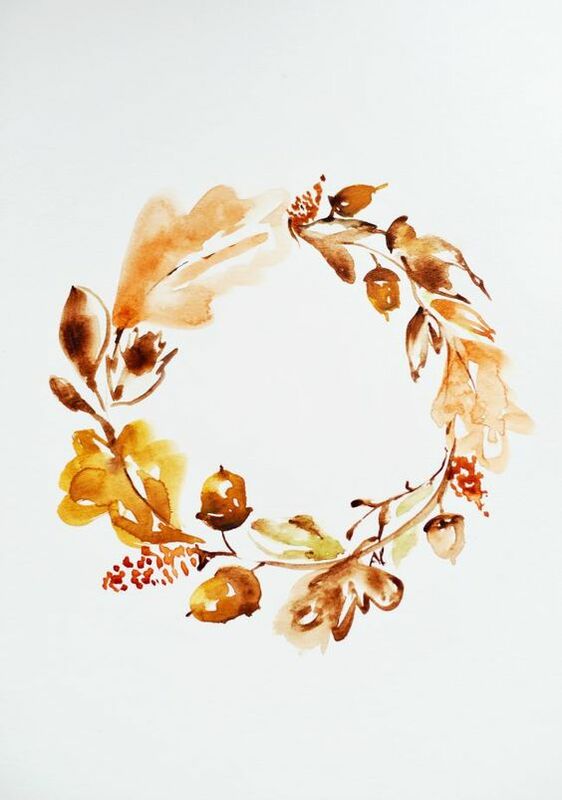 I am loving this Fall Berry and watercolor printable. 5) Lastly, this one says it all…and can be found here . So what do you guys think? Do you love printables and changing them out seasonally? What about any other Fall wall décor such as wreaths, signs, etc. Don’t forget to hashtag myself, along with the seven other others during our fun four week hashtag on Instagram. If you aren’t following me over there, then head on over and do so! I promise, you will not want to miss out. Such pretty options! Love number 3! Love this round up Erin! Lots of great option too! I love #2!